The dystopian soap opera that is Venezuelan politics hit the headlines again this month, now with the proclamation of a new acting President by the opposition-controlled National Assembly. This may be the most serious challenge so far to Nicolas Maduro’s presidency, particularly because this one bears a human face, that of Juan Guaidó. The 35 year-old was virtually unknown before becoming President of the Assembly about three weeks ago. This new critical moment has inflamed the international scene, becoming another theatre in the hybrid war between democracies and dictatorships. But the time has come for the democratic community to adopt a more hawkish position and do their best to finally bring about the demise of one of the most catastrophic regimes since the fall of the Berlin wall. A high-ranking member of the ruling United Socialist Party (PSUV), Maduro served as Minister of Foreign Affairs and then as Vice President during Chavez’s administration. He was hand-picked as successor by an ailing Chavez (who was suffering from terminal cancer), and was sworn-in on the latter’s death as interim President. This was in violation of the constitutional line of succession, where the President of the National Assembly was the first designated successor. He narrowly won a snap presidential election a month after Chavez’s funerals. The small margin of victory of 1.4% was seen by the opposition as reason to suspect fraud. Right after the US declared support for the acting President, a group of academics led by Noam Chomsky released a statement “condemning US interventionism in Venezuela’s domestic politics” and defending its “legitimate government”, all while acknowledging “ hyperinflation, shortages, and a deep depression.” Blinded by their automatic criticism of any US foreign policy measure, these academics ignore the legal reality on the ground: Maduro has already virtually suspended Venezuela’s constitutional government and depends on the vital support of the military to stay in power. In this context, the support democratic countries have shown for Guaidó does not constitute interference with Venezuela’s politics. It is simply a defence of Venezuela’s constitutional order and a statement of choice between two alternative governments: one backed by the army, and the other one backed by the Parliament. This crisis should also be seen as a piece of a wider regional and global puzzle. The sides involved in the conflict reflect the worldwide struggle against the authoritarian tide. The United States, Canada, most South American countries, and the European Union have sided with the Parliament. Meanwhile, Maduro counts Russia, China, Turkey, and Iran among his backers, as well as fellow dictator Daniel Ortega of Nicaragua, who himself ordered a brutal repression of mass protests that he faced last year. Moreover, hosting 2 to 4 million Venezuelan refugees within their borders, the country’s neighbours are confronted with the worst humanitarian crisis in Latin America, with strong effects on the stability and prosperity of the entire region. In this context, there is little wonder that Latin American countries have founded the Lima Group, an ad hoc regional organization meant to promote regime change in Venezuela. The Declaration the Group adopted in 2017 represented a significant step towards the climax of the crisis, this week’s proclamation and recognition of a new, interim government. There is a long journey towards Maduro’s status as an usurper. Venezuela’s last (quasi)democratic elections took place in December 2015, which resulted in an opposition coalition (MUD) winning two-thirds of the seats in the National Assembly, removing Maduro’s United Socialist Party’s majority (PSUV). 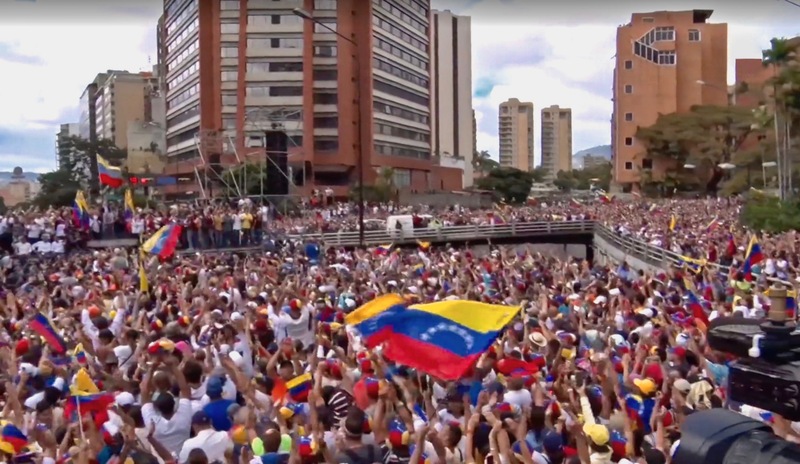 Despite attempts by the Electoral Commission to rig the vote, the victory was a very clear popular rejection of Maduro. But only days before the new Assembly would be sworn in, Maduro had the lame-duck Assembly illegally pack the Supreme Court (TSJ) with loyal judges. Once sworn-in, chaos ensued. The TSJ launched a full attack on the Parliament throughout the year: it refused to validate 3 opposition MPs and left the opposition without its supermajority required for launching impeachment proceedings. It struck down most of its laws. It appointed PSUV members to the Electoral Commission (CNE), despite this power belonging only to the Assembly. With its hands tied in the parliament, the opposition pushed for a presidential recall referendum. But in October, their attempts were thwarted by the CNE, which claimed (without proof) that the opposition-led process was fraudulent. While these events may be arguably considered mere internal affairs, later events reflect the textbook definition of a self-coup. Faced with resistance to its rulings, the TSJ decided to take over the legislature’s prerogatives. In the realm of constitutional law, this was an unprecedented step on a global scale. The ruling not only undermined the principle of separation of powers, it also essentially abolished Venezuela’s constitutional order. Domestic pressure forced the court to abandon its ruling, opting instead to give the executive enhanced legislative powers, though still rendering Parliament redundant. The final nail in democracy’s coffin was the creation of a parallel parliament: a Constituent Assembly, made possible by chapter III of the Constitution. But the text uses very vague wording and does not provide a clear mechanism for how the Assembly would be elected. In fact, the process led to loyalist defections, with two TSJ justices denouncing the decision and arguing that only a referendum would give legitimacy to this decision. Maduro’s government pushed forward and organized the elections. All seats were won by the PSUV, amid an opposition boycott. Once elected, the Constituent Assembly proclaimed itself to have supreme authority and the power to overrule the National Assembly, abusively exceeding its constitutional role to draft a new Constitution. The parallel parliament acts as a rubber stamp to Maduro’s decisions, in a similar fashion to Parliaments in Eastern European communist states before 1989. It was this parallel Parliament that also organised the 2018 early presidential election, which Maduro comfortably won, as the opposition was barred from running. With a Supreme Court that was constituted illegally, a parallel Parliament that lacks any legitimacy and a Presidency that has abused the Constitution in all possible ways and claims legitimacy from a fraudulent election, Maduro’s government is under no definition Venezuela’s legally constituted government. In fact, Article 350 of the Constitution explicitly confers right of resistance to the people against any government that threatens the constitutional order, a right denied by the regime’s widespread use of violence against protesters. The National Assembly remains the only democratically-elected institution in the country. As a representative body of the Venezuelan people, it is well within its constitutional rights to designate an acting President that would be in charge of organising new elections. And the regional community is well within its rights to defend Venezuela’s democratic institutions. There is precedent for this. In 2017, the West African Community of States (ECOWAS) militarily intervened in the Gambia in order to overthrow dictator Yahya Jammeh, who was illegally clinging onto power. The swift intervention restored constitutional order and regional peace, despite a lack of approval from the UN Security Council. By supporting the actions of the Lima Group (but not leading them), this can also be an opportunity for the US to repair its past mistakes. The “gringo empire” has a long history of overthrowing democratically-elected leaders that were hostile to the US (such as in Guatemala, Brazil, and Chile), as well as tacit support for friendly authoritarians. After the Cold War, ideology was less of an issue, but US interests still played a role. In 1992, President Alberto Fujimori of Peru organized a very similar self-coup, using the army to suspend the Constitution and dissolve the Parliament. The OAS and the US condemned the move and declared Fujimori illegitimate, only to change their mind a few days later. In 2009, during the Honduran coup d’état, the regional community forced a swift return the rule of law. However, then Secretary of State Hillary Clinton refused to condemn the coup. The US’s reluctance may bear effects to this day, with long-lasting damage to democracy as well as a constant increase in illegal emigration to the US since the coup. Such behaviour should not mean, however, that we should avoid intervention at all costs. On the contrary, it should provide more impetus to countries in the region to establish strong and clear multilateral mechanisms to keep each other in check and prevent attempts to undermine the rule of law. These mechanisms, on the likes of the Lima Group, can also prevent the emergence of a US-style hegemon, and entrench any action in multilateral decision-making. Today’s regional politics are more integrated than ever. Latin American countries need healthy, democratic neighbours in order to function individually and as a whole. And they must be ready to hasten Maduro’s demise in order to revive Venezuela and protect themselves. Note: this article draws heavily from the original text of the Constitution of Venezuela, which can be found here (in Spanish). Chapter III of the Constitution states that the Constituent Assembly is charged with “transforming the Country, creating a new legal order and drafting a new Constitution”. It also states that it is summoned by the “people of Venezuela”, but this process must be initiated by either the President, two thirds of the National Assembly, two thirds of the cities, or 15% of Venezuelans.